In Part 1, we introduced the series and talked about tools. In Part 2, we installed the magazine catch and trigger guard. In Part 3, we installed and adjusted the Jewell Match trigger. In Part 4, we installed the safety selector, pistol grip and bolt catch. in Part 5, we installed the pivot pin, recoil buffer components and buttstock. In Part 6, we installed the forward assist and the ejection port cover. In Part 7, we installed the delta ring and barrel. This time, we’re going to install the free-float tube and front sight base. In the last post, I mentioned one of the differences between a rifle with a free-float tube and a standard AR…the special barrel nut. Another difference is that the sling swivel is mounted on the float tube rather than the bottom of the front sight base (FSB). That way the pressure placed on the sling when in a sitting or prone firing position is pulling on the float tube, not on the barrel. The problem with this is that the standard A2 FSB has an integral sling swivel mount. The mount on the FSB will interfere with the mount on the free-float tube and, so, it’s gotta go. This is where the dremel tool and carbon cutting wheel come into play. Of course, you want to be careful and consider that the more attention to detail you give this, the better the end result will look, but it’s a pretty simple procedure. 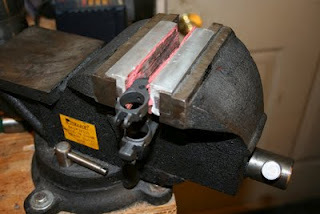 Clamp the FSB into a vise with padded jaws (or cushion it with rags or pieces of wood). 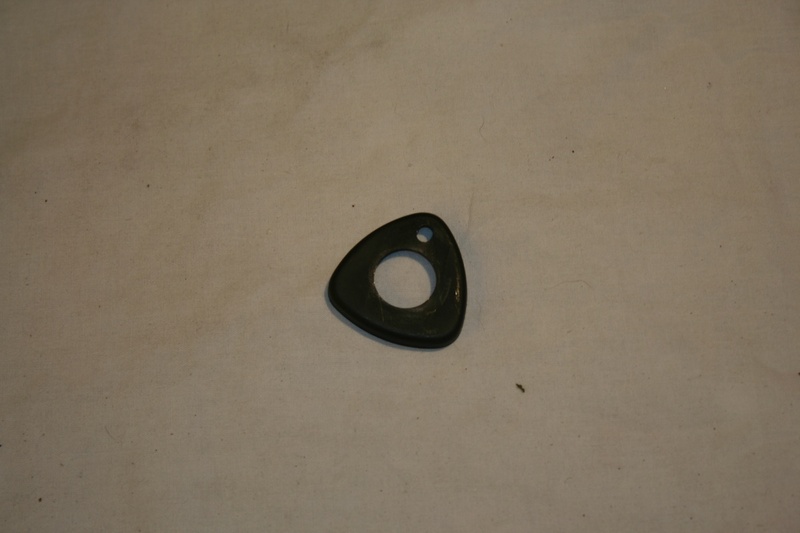 Cut the sling swivel mounting ears off as close to the bottom of the FSB as you safety can. You could use a hacksaw for this and I would imagine it would work fine as long as you’re careful. I like the control that the dremel tool gives, but if you don’t have a dremel tool, you probably don’t need to buy one just for this job. 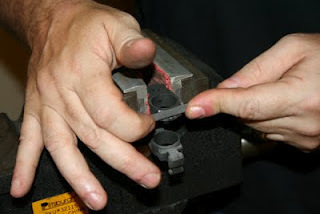 If you need to take some excess off, carefully grind the remaining stubs down until they are almost flat against the bottom of the FSB. 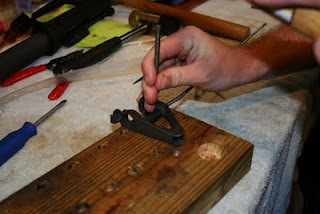 Then use a fine jewelers file to square it up and remove all traces of the sling swivel mount. You probably can’t really tell in this picture, but the bottom of this FSB is not completely flat. The areas where the sling swivel mount ears were just removed angle down slightly toward the center, where there is a narrow flat spot. I didn’t file the FSB bottom completely flat, but maintained this angled contour in the areas where the sling swivel mount was removed. I took another step and used a fine stone to remove the filing marks. You could also use emory cloth sand paper at, say, 400 grit or finer to remove the filing marks. It doesn’t have to be polished or anything, but you want it smooth enough to look “stock”. Basically, you want to hack the sling swivel mount off without it looking like something’s been hacked off. Finally, clean the filings off and hit the bare metal you just made with some cold blue to preserve it and match the finish. With that prep work done, let’s install the float tube. The free float tube consists of (in addition to the barrel nut), the tube itself, which has the handguard retainer and sling swivel mount permanently attached, and a lock ring. On a standard barrel, the handguard retainer is just fitted over the barrel and is held on by the front sight base. That retainer can be discarded as the handguard retainer in this case is mounted directly to the float tube. On my Rock River free float tube, the sling swivel was not attached out of the box. The tube came with the sling swivel and rivet, but they weren’t installed. Installation is simply a matter of putting the sling swivel on the mount on the free float tube, sticking the rivet through the holes, and smashing the rivet down with a big punch and hammer. Next, you may have left the locking ring on the barrel nut while you were installing the barrel. If not, thread it onto the barrel nut exterior threads. and screw it on as far as it will go, but don’t tighten it. Note the round dimple in the locking ring. That will come into play later. 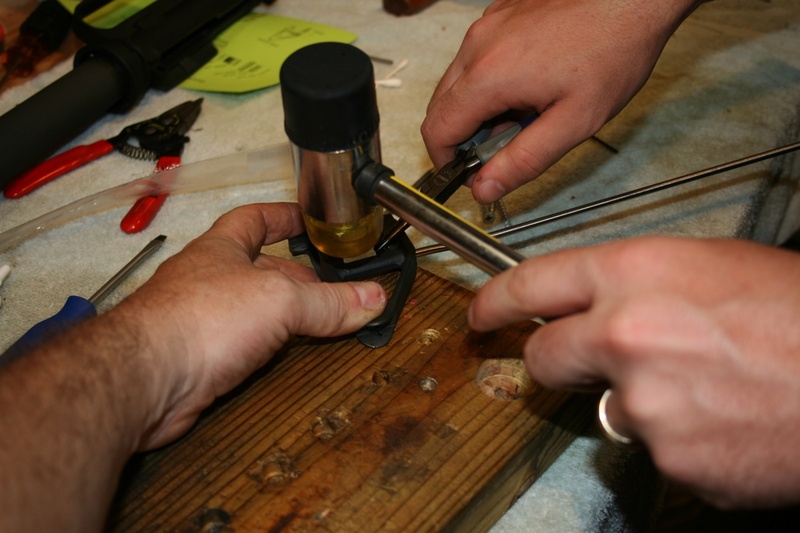 Then slide the float tube over the barrel with the handguard retainer and sling swivel toward the end of the barrel. Screw it onto the barrel nut. This is why we needed to remove the sling swivel mount from the FSB before mounting the float tube. You need to verify the position of the float tube before tightening it down. Get the float tube positioned about where you think it should go…then slide the FSB onto the barrel and into place to check its position. I didn’t think to take a picture when doing this, so I took one later, after the gas tube had been installed already. The float tube should be as close to the FSB as possible, without touching it. If they touch, the tube will interfere with the barrel and defeat the whole purpose of free-floating the barrel. If you make the gap too great, however, the handguard retainer may end up too close to the delta ring and the handguards may not fit. Also note the sling swivel below the bottom of the FSB. had we not removed the sling swivel mount from the bottom of the FSB, the sight base would not have fit. Once you’ve verified the position of the free-float tube, take the FSB back off again. Unscrew the float tube from the barrel nut 5 or 6 turns. Be sure to count, you want to be able to screw it back in the exact same number of turns. Then put a bit of blue thread locking compound right where the edge of the float tube will be when screwed back in. Put enough on that it will also be under the locking ring once it is tightened against the float tube. Screw the float tube back in the same number of turns that you screwed it out. Then, screw the locking ring out until it contacts the float tube. 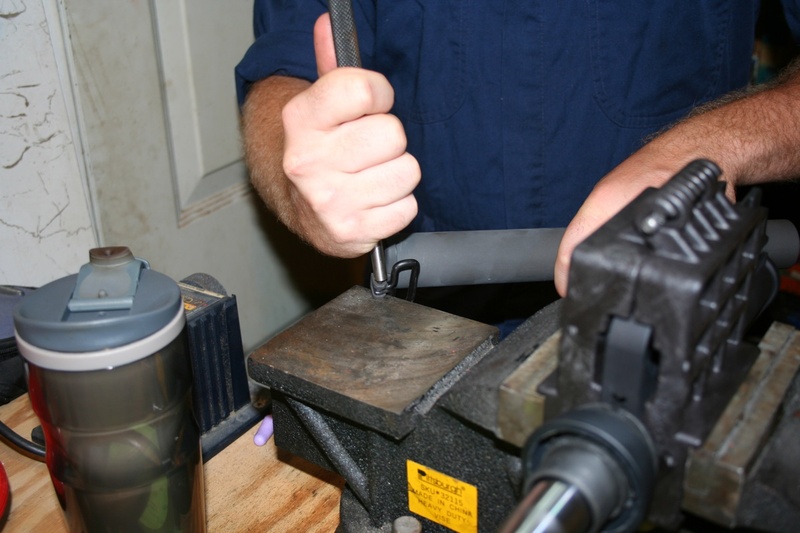 Before tightening the locking ring, be sure the float tube is as perfectly straight up and down as possible. the gap that the gas tube will pass through needs to be centered over the gas port in the top of the barrel. Remember that round dimple in the locking ring that I pointed out before? This is where it becomes important. There is a section of the AR-15 multi-tool that acts as a spanner wrench. It’s a half-moon looking area with a small peg at the end. 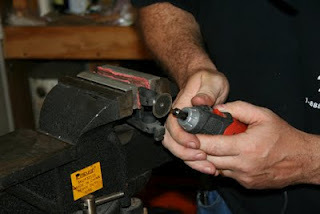 Place the half-moon part around the locking ring so that the peg on the tool locks into the dimple on the ring. 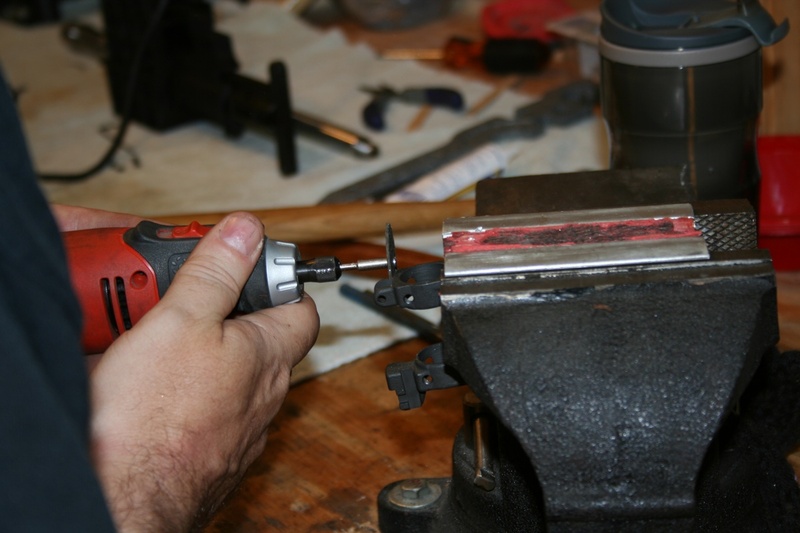 While holding the free float tube to keep it from turning, tighten the locking ring against the tube firmly to lock it into place. And the float tube is done. The FSB installation on a match rifle is different from a standard AR-15 in two ways. On a standard AR (and even some match rifles, for that matter) the FSB is held on with tapered pins that pass completely through the FSB and barrel. 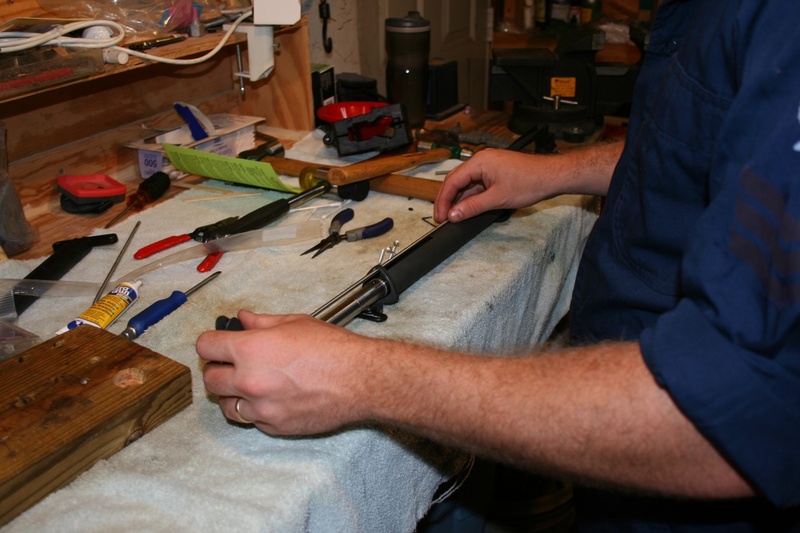 One of the accepted modifications for a match rifle is to drill and tap the taper pin holes in the FSB and use set screws to hold it on. This allows the FSB to be adjusted for windage. On a match rifle, you want your zeros to be as close to the actual zero settings on your sights as possible so that you have the full range of adjustments as well as having known starting points for all adjustments. This also means that the barrel is slightly different between a standard FSB and an adjustable one. 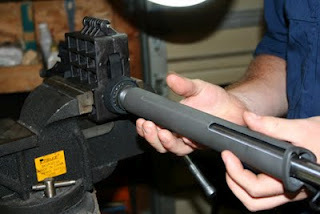 With a standard FSB, the taper pin holes are drilled through the bottom of the barrel. With an adjustable FSB, there are no holes, but generally “flats” are milled into the bottom of the barrel for the FSB set screws to mate with. That simplifies the initial installation of the FSB, but complicates finalization because you have to adjust it before securing it permanently. for purposes of just getting it onto the rifle, however, it’s pretty straight forward. 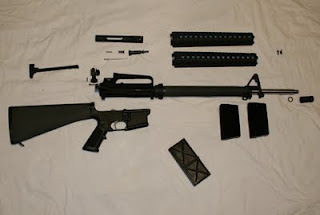 The front sight base installation involves the FSB itself, the gas tube and the gas tube roll pin. The gas tube is the final difference that results from using a free-float tube. On a standard gas tube (top), the bend in the tube that accounts for difference in height between the gas block and the tube position in the receiver is just aft of half-way. Because the free float tube encloses the barrel, the bend in a gas tube used with a free-float tube must be much farther forward (to the right in this picture) than with a standard installation. The modified gas tube (bottom) was provided with the free-float tube. One other note about the gas tube. 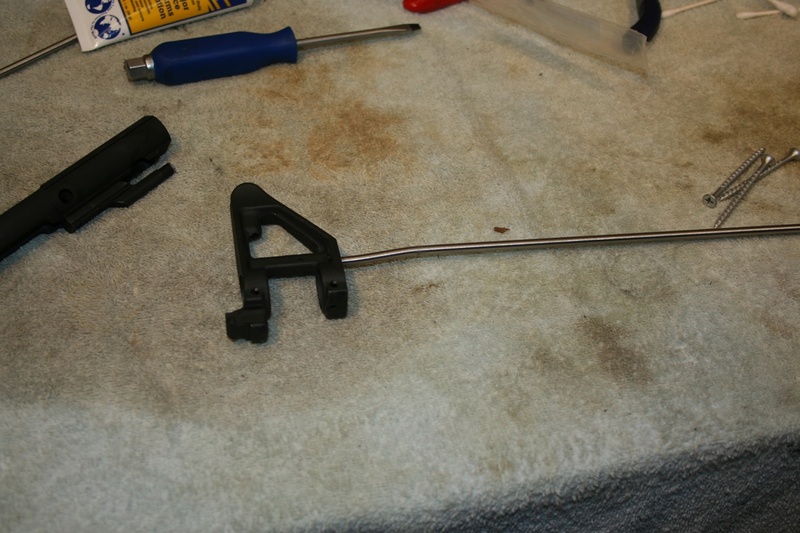 When I first tried it, the gas tube that came with the free float tube wouldn’t fit into the bolt carrier key at all. I thought I had gotten a defective gas tube at first; however, the gas tube is fairly soft metal. What I did was push them together and spin them both against each other. After working them for awhile, this shaped and shaved the gas tube enough that it eventually fit inside the bolt carrier key smoothly. I don’t have the experience to really know but they may have made the gas tube slightly oversized on purpose with the intent of fitting it to the key for a tight seal. I suppose you could mount the FSB to the barrel first and then install the gas tube, but it made more sense to me to pin the gas tube into the FSB first. Be sure that the gas tube is inserted into the FSB correctly before installing the pin…the end of the gas tube with the holes goes into the FSB. The small hole that passes completely through the tube is the hole for the roll pin. The larger hole that does not pass completely through is the gas port hole and needs to be pointed toward the bottom of the FSB (toward the barrel when the FSB is mounted). Be sure to get the roll pin hole in the gas tube aligned perfectly with the holes in the FSB. The gas tube is relatively soft and you will crush it if you try to drive the pin in with the holes misaligned. The gas tube was a tight fit, so after getting it aligned, we didn’t have to worry about it moving. A tiny little pin punch could be used to help you get them aligned, or a piece of wire, dental pick or other object small enough to pass through the holes might help. We just aligned it by looking through the hole under magnification which worked fine for us. The gas tube roll pin is very small so we held it with a pair of needle nose pliers and used the nylon mallet to get it started. Then finished it off with a pin punch. Next, make sure the channels in the barrel retaining snap ring, weld spring and delta ring are lined up with the notch in the barrel nut. 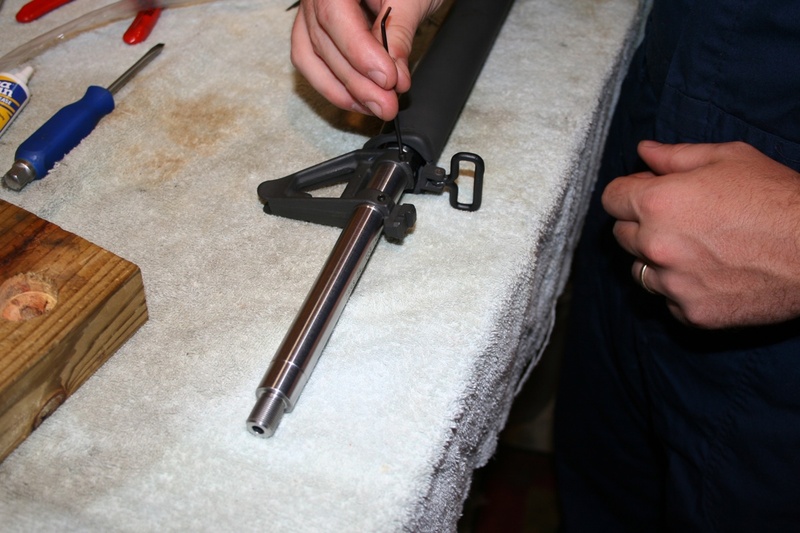 As you press the FSB into place on the barrel, pass the gas tube through the channel in the barrel nut/delta ring assembly and into the upper receiver. Double check to make sure there is a gap between the rear of the FSB and the float tube, then install and snug down the set screws that secure the FSB to the barrel. No reason to use thread locking compound on them or torque them down yet…we’ll need to adjust the FSB to zero with the rear sight first. And that’s it. Starting to look like a rifle. The barrel installation, including free float tube and FSB, were the most difficult part of the whole assembly. It really was MUCH easier to perform than it was to describe. Now that I’ve done it once, I think I could do everything described in the last two posts in about 30 minutes tops. I would say that as long as you invest in the right tools, have any modicum of mechanical ability, and take your time, this is well within the capabilities of your average gunny. Next time we’ll install the handguards, install the flash hider, assemble and install the bolt carrier group and mate the upper and lower together. 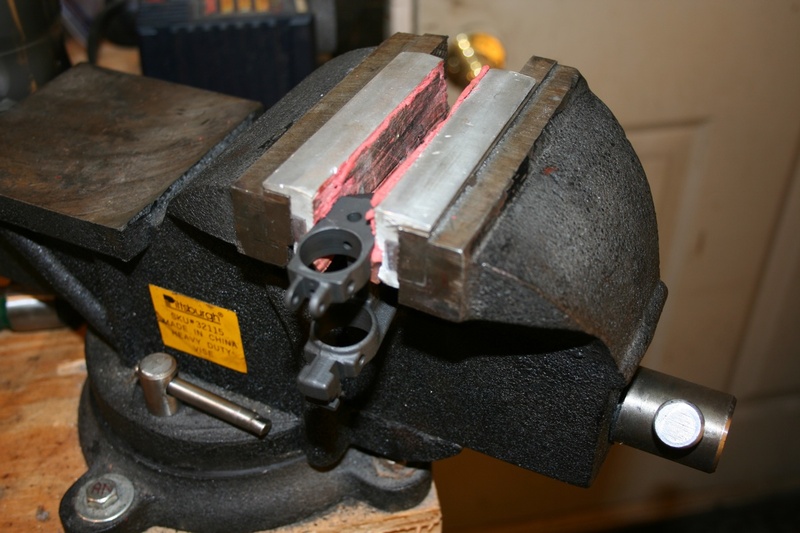 This entry was posted in AR-15, Gunsmithing, NM Rifle Build, Rifles by Sailorcurt. Bookmark the permalink. Thank you very much for this, I've done lowers but not uppers, I want to do an upper now. I've always in awe of your demonstrated efforts and abilities. Now I know how you do it.. you have three hands! Oops, I let the secret out. That's how I take the pictures while I'm working. Thank you so much for this information but please tell me there’s a part 9. That where I’m stuck at! My link to part 9 was broken. It’s fixed now.